Want bigger lips? It takes just a minute to plump up your pout! How Do You Get Fuller, Bigger Lips With Just Makeup? So, what options do you have for bigger lips? Well, as you know, illusions can be easily created with colors and lines. So use your makeup in a clever way by making the most of what you have on hand. Then you won't have to inject anything into your lips to plump them up! Firstly, always make sure your lips are smooth for any application. An easy, fuss free way to do this is to brush your lips every time you brush your teeth. Otherwise use a scrub and a cloth, or whichever way you're comfortable with, to exfoliate your lips. Then follow up with a lip balm that works for you. This can be vaseline, balm, or any lip cream. The first tool in your big lip arsenal is simply the color of your lipstick. Light colors make things look bigger, so choose a lighter version of your favourite colors if you want to expand your pout. Don't forget to choose lipstick colors that enhance the rest of you! Then another consideration should be the finish. A matte finish is flat, so the color rather absorbs light. A glossy lipstick reflects light, and this makes the lips seem bigger. So this works if you want to use darker colors, but still want them to look big at the same time. You can also use gloss the conventional middle part to make that rounded. If you only want the top or bottom lip to seen fuller, then do what is recommended on only that one. Another thing, is that most people know the method of lining outside your lip line to create bigger lips. I'm not going to go into it because a lot of the time it end up looking fake, and unnatural. Only do it if you can be very discreet with the liner, and keep the liner as close to your natural lip line as possible! The methods here are the most subtle and natural looking. Highlighter, or concealer that is a shade lighter. First, line the darker concealer along the underside of the bottom lip. 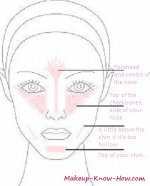 Then line the cupids bow, or the whole to top lip, with highlighter. Apply a lip liner, along the edge of your lip, and fill in with lipstick. Blend the concealer very, very well for better results...Blending is a must when you're creating any color illusions on your skin... You want your illusions to seem very real! For the second contouring method, you'll need your regular concealer or white liner. Apply lipstick(or skip it if you choose), then apply your chosen product on the middle third of both upper, and lower lips. You can also apply the concealer along the top of your bottom lip. The third way is basically the same as the one above, except that you're using two different lipstick colors, instead of diluting one lip color. This though, is the most difficult way to plump up. The key is in using a lip brush for blending. Begin by applying the lighter color all over the lips. Then apply the darker color on the sides. This can be done with lipstick, or in combination with liner. After application, blend,blot, and repeat. Combine the first contouring method with the second or third, and that'll maximize the bigger lips look!